Welcome to Season 2, Episode 1 of Scary Stories Told in the Dark, starring Otis Jiry. In this episode of Scary Stories Told in the Dark, we bring you five terrifying tales by John Casuccio, Moonlit Cove, H.P. 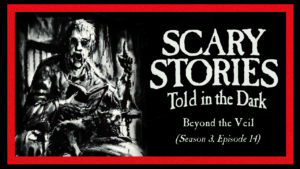 Lovecraft, and two who prefer to remain anonymous, performed by host and narrator Otis Jiry, about unsettling after-school activities, secret passageways, unearthed oddities, and dangerous games as old as time. The version of this podcast which is made freely available here contains the first 3 stories listed. To enjoy the premium, extended version of this episode – as well as our extensive audio archive of other terrifying tales – please sign up for a Patrons accounts today. I am so happy I found this podcast. Otis Jiry is amazing. The stories he tells are amazing. I listen to this every night till I pass out lol. Even got my son hooked! Thank you very much for the kind words, Nicole!